The Federal Republic of Somalia is located in the Horn of Africa. It is bordered by Ethiopia to the west, Djibouti to the northwest, the Gulf of Aden to the north, the Guarhdafui Channel and Indian Ocean to the east, and Kenya to the southwest. Somalia has the longest coastline on Africa's mainland, and its terrain consists mainly of undulating plains, plateaus and highlands. Somalia is drained, on the one hand, by rivers to the Indian Ocean but also by others flowing to large internal lake basins, the greatest of which is Lake Victoria. Somalia was an important commercial centre during the Early Islamic Times until the 16-17th century exporting Gold, Slaves, Ambra, Ivory, Incense, and hide furs. Later in times of the European Expansion and during the 19th century, Colonialism and Imperialialism (Britain and Italy) disrupted the connection between the Horn of Africa and Arabia, S/E-Asia and other Parts of the African continent and left an impoverished society. After the 1980ies continuous wars and a desastrous civil-war made Archaeological projects virtually impossible- in a country with very rich and untouched MSA and ESA- sites. For sure Desmond Clarke, the great Africanist, was the last who had the opportunity for saving a considerable variety of Archeological materials during WWII operations in this country. His synthesis of the Stone Age of the Horn of Africa described already known surface collections, new surface collections from his 1940 campaign and some limited statified ensembles- both MSA and LSA. After WWII some rare notes about the local MSA and LSA were published, for example by Brand who made in 1982 limited excavations at the important MSA site of Midhishi 2, which had some affinities to the Porc Epic materials in Ethiopia. After the mid Eighties, Archeological news from Somalia got sparse- but they never stoped completely-especially on the issue of the “Hargeisian” sensu Clark- a late Pleistocene (MIS 3) lithic industry with both LSA and MSA- affinities (the association of Levallois, laminar, and microlithic technologies), recently reintroduced after modern excavations at shelter 7 of Laas Geel, Somaliland. The trihedral Acheulian pic of this post was found most probably during 1896 by Seton-Karr and later in the large collection of Dr Hugh Alderson Fawcett (1891-1982). Heyward Walter Seton-Karr (1859–1938) was of Scottish descent, educated at Eaton, big-game hunter and adventure traveller, associated with the Royal Geographical Society. He made four expeditions to Somalia in the 1890ies. He was also a enthusiastic collector of stone artifacts all over the British Empire (Predynastic and Dynastic Egypt, Somalia, India). Much of his collections are now dispersed over several large Museums (British Museum, Le musée des antiquités nationales, Saint-Germain-en-Laye, the Smithsonian). In Cairo, the Egyptian Museum possesses hundreds of objects from Upper Egypt and the Fayum donated by Seton-Carr. 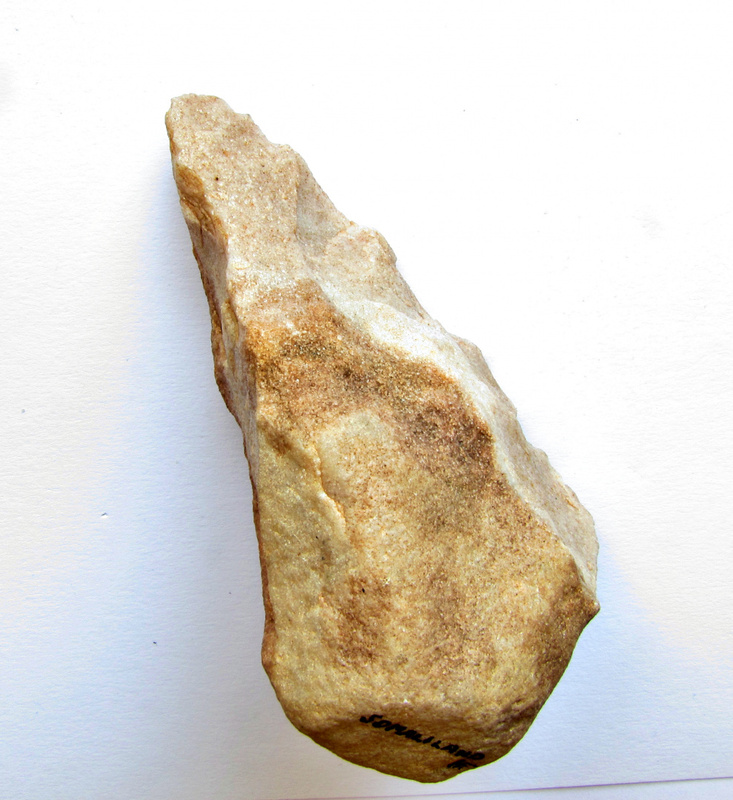 He discovered his first lithics at Jalelo, roughly mid-way between the port of Berbera and the inland town of Hargeisa, to the north-west, in Somalia. Seton-Karr found hundred of ESA artifacts on the slopes of a hill near the Issutugan River, situated in the same region, but never in original context . We also know of rich MSA findings with Levallois signatures from his expeditions in Somalia, now housed in the Australian Museum / Sydney. 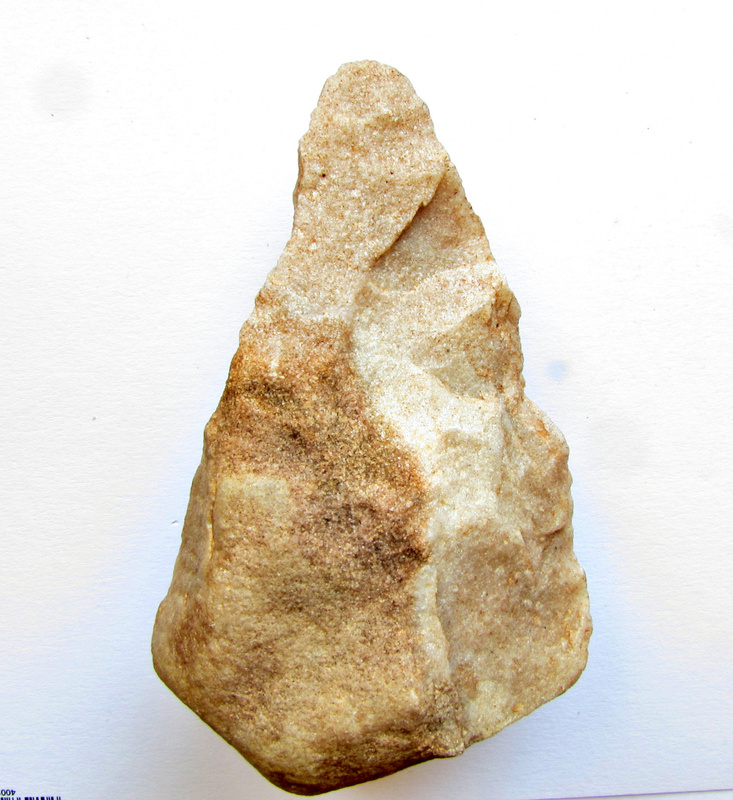 Bifaces of his collection are mostly made of Quartzite and display different forms: "Classic Ovates and Pointed Handaxes" but also rough outs and delicate, more archaic trihedral pics, like the specimen shown here. This trihedral could be about 1 My old. Seton-Karr was educated enough to notice that his findings were Paleolithic and resembled to the already famous UK- and French specimens from Hoxne and Abeville / Saint Acheul. As a Victorian Gentlemen and reputable amateur Archaeologist he had access to the small scientific network in his home-county and when he showed his findings to the eminent archaeologist John Evans, they agreed, that these handaxes could be well the first-ever found in Africa, south of Egypt. Anyhow, Evans strictly asked for stratified findings of these ESA artifacts. Seton-Karr’s tools from Somalia were exhibited at the Royal Archaeological Society at their meeting in London in 1897. For his contributions to Archaeology, he was awarded the Galileo Gold Medal by the University of Florence. Maybe Seton-Karr, would have had the luck to find lithics in situ, but he died tragically at the age of 61 when the ocean-liner he was on, the RMS Empress of Ireland, sank on 29 May 1914 in the gulf of the St. Lawrence River in Canada after a collision (Zeni, 1998). I am sure, that renewed surveys and excavation could give us new insights in the Pleistocene Prehistory of the Horn of Africa. Multidisciplinary efforts from Oman and Saudi Arabia during the last 10 years have produced a wealth of high quality ESA and MSA data in such quasi "untouched" regions.